12 x AMD GPU rig. 6 x Red Dragon RX580 8GB, 5 x Sapphire RX570 4GB and 1 x Red Dragon RX570 4GB. H110 BTC pro board, 256GB PPCIE SSD, 8GB ram, 2 x HP server 1200W power supplies for cards and 1 x ATX for board. Licenced copy of w10 pro 1806 and running latest AMD 19.1 driver. Cards have modded BIOS to get the best Mhs/Watt profile. Currently runs 355+ Mhs at 1600watts. Will run 365Mhs but it's up at 1800 watts and sees very little extra shares at that rate. Very tidy build, has been tuned very well. I've worked as a tech for 18 years so this isn't a unit that's just been hobbled together. This has run for about 10 months. I ran from Oct-May last year and turned it off when crypto fell. It's been running again since November and mainly as a source of heating since values of coins are low. Loads of spares inc PSU, risers, power cables etc available. All original boxes and BIOS also included. Collection only so I can provide handover. 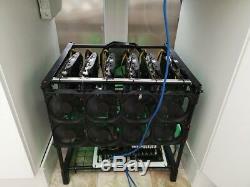 The item "12 GPU RX570 RX580 8GB 360Mhs Crypto mining rig Ethereum monero zcash bitcoin" is in sale since Tuesday, February 5, 2019. This item is in the category "Coins\Virtual Currency\Miners". The seller is "a_and_j_trading" and is located in Clacton-on-Sea. This item can't be shipped, the buyer must pick up the item.